Back in December we submitted a second paper in our efforts towards developing ETHOS. On this paper, we use the effective mapping developed in ETHOS I, to construct initial conditions for several dark matter models, which we use as the input of cosmological simulations. These simulations follow evolution of a dark matter halo as it grows into a structure similar in size to the halo of our own Milky Way. 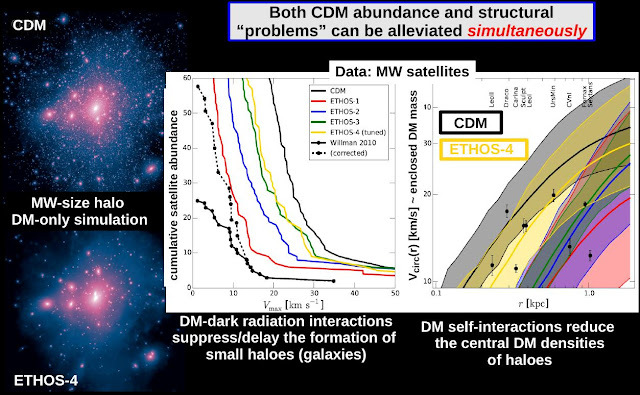 We have found the conditions under which dark matter self-interactions and interactions with dark radiation (DAOs) can alleviate a couple of outstanding challenges to the current model of structure formation (CDM). These challenges are related to the abundance and inner structure of dwarf galaxies (I have briefly mentioned both in earlier posts). Check the image below that I have prepared for a talk I'll give about ETHOS.